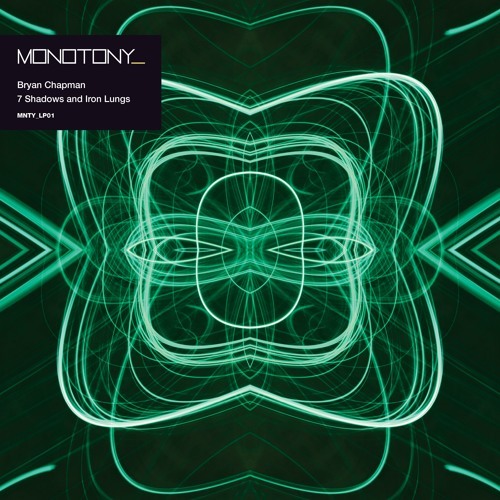 Named Mixmag Album of the Month, October 2018 After releasing four EPs over the last year in his story of a traveller’s journey to enlightenment series, Bryan Chapman delivers his debut album, ‘7 Shadows And Iron Lungs’ on his own label, Monotony. Living in seclusion in southern England, Bryan Chapman is part of the conveyor of talent that hails from this ever growing, under current of modern techno found on the shores of the south coast. Now an established name amongst the new breed of producers breaking through, Bryan has earned a reputation for making no-nonsense, heavy-weight tracks that have seen his music supported by taste-makers across the techno scene including Luke Slater, Adam Beyer, Slam, Laurent Garnier, Chris Liebing and many more. He has previously released on labels like Cari Lekebusch’s H-Productions, Alan Fitzpatrick’s 8 Sided Dice, Dustin Zahn’s Enemy, Joachim Spieth’s Affin and Butch’s Bouq. Now with his own label, Bryan’s aim for Monotony is “to create psychedelic and monotonous techno”, which should not be seen as self-deprecating. Instead think stripped-down, hypnotic, repetitive, linear, dark techno loops that intertwine around each other with subtle yet devastating effects, creating a style of techno reminiscent of times long since passed merged with modern forward thinking electronics. The concept of ‘7 Shadows and Iron Lungs’ is about finding serenity in the acceptance of death. “It’s better to be a shadow that fades in the wind than live in an iron lung prolonging the inevitable”. Tracks like the deeply hypnotic and shifting ‘Cylon’ take us to a place where Jaki Liebezeit plays electronic modal slo-mo drum workouts from the heavens above whilst ‘Carcosa’ brings a subtle electro-swing to Bryan’s deep and evolving motorik groove. ‘Black’ perhaps the album’s cornerstone, anchors a near 15 minute opus of exquisite shuffling, psychedelic techno into a dystopian, atonal vision of ‘E2-E4’ (Jóhann Jóhannsson’s binned vision of Bladerunner 2049). The aptly named track ‘7’ builds into a desolate soundscape of brooding menace whilst the far more direct techno pulse of ‘I Don’t Know What My Mother’s Feet Look Like’ is, considering the title, the albums most straight-forward club workout. Finally ‘Embers’ builds into a towering wall of electronic sound before the album’s closing track, ‘Dead Shadows’ embraces the cold kiss of death with ephemeral recognition. Fusing future sound design aesthetics with minimalist techno principles, ‘7 Shadows & Iron Lungs’ is as an accomplished debut techno album you are likely to hear this year.